Is Qmee Legit? Or A Giant Scam? Last updated on January 2, 2019 By Nat Leave a Comment This post may contain affiliate links. We appreciate you supporting Rags To Niches! Full disclosure here. 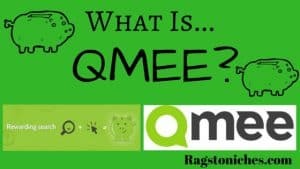 What Is Qmee? Is Qmee Legit, Or A Scam? Price: Sign Up Here Free! Overall Verdict: Legit! This won’t make you rich, but this can make you a little extra pocket change. Review In Brief: Qmee simple to use, as there is a neat extension that just sits on your browser and will alert you of any deal. It’s really a no-brainer, it takes no effort and can save you a bit of money. Plus, they now have an App too, which I’ve enjoyed more than the regular website. I can safely say, Qmee is not a scam. It’s actually quite an interesting and easy way that you can make a few extra bucks – mainly from searching the web as you normally would. Once you’ve signed up for a while, you also get the the opportunity to complete surveys for extra cash, or refer friends. To get started, you simply add the browser toolbar extension to your computer, (compatible with most browsers, including google chrome and internet explorer) which takes seconds to do. You can then just surf the web as normal and Qmee does the rest. Qmee will alert you to special deals or offers as you search. When you search for anything in your regular search bar, Qmee will add relevant Ads to you in the left hand column. The Ads aren’t only displayed via your typical search engines such as Google/Bing/Yahoo – you can also get Ad suggestions when using Amazon and Ebay too. As well as getting paid for clicking these Ads, the ads themselves can actually be helpful by finding you good deals. By just clicking on these Ad suggestions, you can earn money, as well as deals relevant to you. A word of caution though: You can’t just spend all day clicking and searching Ads. Qmee will chuck you out for abusing the system if they catch you out. You will be able to see exactly how much each Ad click is worth, as it’s shown on the Ad. After you have been with Qmee a little while, they will also start sending you surveys and you will receive an affiliate link, where you can then start referring friends – you can then earn a portion of what your friends make too. Qmee has not got a limit on what you can potentially earn, but another decent feature is that there is no minimum payout threshold either! As you can see to the image to your right, I was searching for Garmin watches and this Ad post came up to the left of my screen. I clicked on the top Ad and immediately 6p, (around 8 cents). I’m based in the UK, but you can also use Qmee in the USA. As long as you have Paypal set up, you can withdraw what you earn at any time. This is quite unique in comparison to other similar programs. You need to have $5 before you can withdraw with Swagbucks – for example. But there are lots more ways to earn via that site, so it can happen quickly. What’s more, your money should appear in your Paypal account very quickly once you withdraw on Qmee, which is also a rarity with survey/search engine related money making sites. However, the amount you earn varies – and it’s not going to be much! From what I’ve seen, it could be anything from a few pence/cents, to a dollar per click. (Most being around 5-12 cents/pence as far as I can see). No doubt, it will take a while to accumulate any profit and this is certainly not a giant money making opportunity by any means – but it is a simple one. I like it! It’s actually fun to use. There is no effort involved in using it at all, so why not make money for doing what you normally always would anyway? UPDATE: You can also cash out via giftcards now: Amazon, Itunes and Starbucks. How Qmee Works – Walk-through Video On YouTube! Unlike most survey related sites, there is NO minimum payout. These is a huge bonus. You can withdraw directly into Paypal, with no minimum cashout. Alternatively, you can opt for gift cards or give your earnings to charity. So simple to use, just surf the web as you normally would and that’s that! You can use Qmee on Amazon or Ebay, as well as all the major search engines. It’s a very small amount that you earn, it would take a while to build up into anything substantial. If you’re not someone who searches much for specific products, there won’t be many Ads for you to click on. Only available In the US/UK. While there is a referral program, it is not available to everyone right away – you need to be an active member for a while and you only earn 50p per referral once they’ve made a withdrawal. No APP available at the moment, you can’t use on mobiles/tablets. Strongly based on product related searches. It can get a little annoying when it pops up all the time. Conclusion: Is Qmee Legit? Or Just A Big Scam? From what I can see and what I’ve experienced of this company – Qmee is definitely not a scam and is totally legit! In fact, I have enjoyed it a lot more than many sites like this. It’s very quick and easy to get started with it and while you won’t make a tonne of money, you can make a little here and there, so what’s not to like? I think it has some great features, such as the no-payout-threshold and is a good way to save a little bit of money up on the side, without even trying. While it’s small change, by signing up to a few similar sites, you can start building up a more substantial amount. Wanting More Substantial Payouts Long-Term? If you’re looking to make an additional income or even full time income online, joining any number of survey related sites will not get you there. While there are multiple ways you can build up streams of income online, the way I make the most online right now is via affiliate marketing. The start up costs for getting started with affiliate marketing are very low, you don’t need any physical products to sell and you don’t even have to deal with customer service – you earn a commission for promoting other peoples products. Check out where I got started – you can try it yourself for free too. Have you had much experience with Qmee? Let me know in the comments below. Ways to make 100 dollars a day online.